The Braemar Hybrid Smock is fully waterproof in the shoulders and hood and weatherproof elsewhere, creating a smock which is lightweight but can be worn in most conditions including showers and sleet/snow. The windshirt's hybrid concept gives excellent breathability, making it Ideal for mountain biking, hillwalking, skiing, climbing and bushcraft. Available as a base no-frills smock, the Braemar Hybrid can also be customised by adding side zips or extra pockets. Consider a Talorc Hybrid Jacket as an alternative full zip garment. I’ve been using my hybrid smock now every weekday cycling to work for the past 3 months. So far it’s been faultless , keeping me dry in the rain and with the side zips it provides ample air flow for cooling when warm. The large hood is well designed allowing good visibility behind you when needed cycling with no obstruction. The front pocket is of an excellent size allowing you to keep personal items dry and accessible . I also really like the the hand warming pockets when used out walking , it’s an incredibly versatile piece of kit. Mine’s in Blaze colour which is I personally find the perfect colour for cycling, walking and indeed skiing which will be its next adventure. Thank you to Dave and the Hilltrek team , I’m extremely happy with this piece of hard wearing functional kit that should give me many years of use. First impressions: surprisingly lightweight. Small size with 3cm extended arms and hem is 640 grams. Hood is nice and roomy. Metal wire inside. Looks fairly good. Double layer on the shoulders cover more of my shoulders as the pictures imply, which is good. Kangaroo pocket is double layer to the outside so stuff like phones should be kept relatively dry. Not used in the mountains yet, so not able to review. Feedback to the team...Side zips (optional) could creep open during use. A stud at the zip opening will prevent this. Place stud between the zip and the hem cord, or if space not available, place on a stud tab. Thanks for your feedback on the side zips Peter. We will review the design. This smock is EXTREMELY well made and is sized exactly as their guide says. Really the best quality outdoor gear I’ve ever acquired and for a price comparable to or less than the chinese made plastic stuff that the big name manufacturers sell. HIGHLY RECOMMENDED. I've had the smock for several months now, worn in most days over the late autumn and winter. Mainly walking the dog in all weathers, but also on hill walks, including driving sleet. Really impressed with this, the first ventile clothing I've had. I love the way it soon become soft after a little wear, and the fact that it's quiet and rustle-free. It cuts the wind brilliantly and really is waterproof - certainly for the uses I've put it to. After several hours in driving rain and sleet there was a bit of dampness on the inside, probably on the single layer - I can't remember. But with merino layers under the smock this was no problem at all. Just one minor niggle: when the cords to cinch the lower hem are pulled tight, the ends dangle and keep brushing against my hand. A little pocket or loop inside the hem to tidy them away would be nice. Overall - delighted with it. 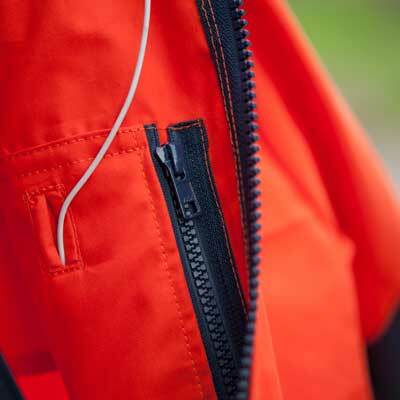 The Braemar Hybrid Smock is very well designed with lots of neat features. The double layer of Ventile on just the shoulders will be ideal for climate I will be using it in (New Zealand). The smock was made to a high standard and the ordering process was easy and efficient.